U.S. companies owe more money than ever, and the quality of their loans and bonds has deteriorated. Since October 2018, rising interest rates and slowing growth are negatively impacting markets suggesting this could be the source of the next market crash. I recommend getting out of any bond funds that you are currently holding in your 401K. Chances are, these bond funds have names that sound like they hold mostly U.S. Treasury bonds but actually have a very high exposure to the high-yield junk bond market. Read the prospectus or look them up on Morningstar to see what percentage of their holdings are in junk bonds. You might consider moving into an interest bearing money market or cash account. With rising rates and a rising U.S. dollar, it’s still too early to buy gold. Gold will be a good buy when something so bad happens that it suggests the Fed is done with rate hikes this cycle and may even start lowering rates. Banking and loan originations are all about credit, and credit is all about confidence. When a borrower loses the confidence of its lenders, things can get ugly really fast. Nearly a decade of abnormally low interest rates has fueled a massive borrowing boom. Companies borrowed money to buy back shares so CEOs and executives received bonuses based on stock performance. More companies borrowed money to expand operations in the US and overseas. Development stage biotechnology companies borrowed money to keep staggering along like zombies while their drugs slowly move through clinical trials and towards FDA approval. United States nonfinancial corporate debt stands at a record level of more than 73 percent of gross domestic product, according to the Bank for International Settlements. It never exceeded 65 percent before the 2008 financial crisis. With rising interest rates and a slowing economy, we’re going to stress test the biggest corporate credit market in history for the first time. We will see just how much confidence lenders have of borrowers. Investment-grade yield spreads at about 1.32 percentage points are the widest in months but are still far lower than the 2.24 percentage points reached in early 2016 after oil prices collapsed and energy companies had trouble meeting their debt payments. Not only are interest rates rising, lenders are also concerned about the crowding out effect, with companies having to raise yields even higher to get investors’ money as the U.S. government raises its borrowing to unprecedented levels to pay for a $1 trillion a year budget deficit. GE is very close to having its bonds slide below investment grade to junk bond status. A slide below investment grade at GE could become a pivotal moment in the U.S. credit market’s nine-year bull run and would flood the $1.2 trillion junk bond market, increasing the amount of tradable high-yield debt by about 10%, according to Fitch Ratings, which would hurt the price of other high-yield debt bonds. In other words, GE is a systemic company when it comes to credit markets. It could cause panic to have that much paper moving from investment grade to high yield junk bond status. The chart of HYG is a major factor in the stock market prediction algorithm that I cover each week on the Saturday Show. HYG helped me predict the October 2018 correction. That tells me that the October correction started in the credit markets. Notice that on Friday, November 16, 2018, HYG took another plunge lower! The stock market often follows HYG lower within 3 to 5 trading days. At the very least it tells us that it’s too early to go long the S&P 500 off the higher low and recent upward move. It’s not just GE. Many other U.S. companies have been downgraded. A record number of company credit ratings are on the cusp of fallen angel downgrades. Moody’s said the dollar value of U.S. corporate bonds outstanding rated at its lowest investment-grade rung of Baa rose to a record $2.83 trillion in Q3 2018. The debt of companies carrying triple-B ratings, the lowest investment-grade category, more than doubled from pre-crisis days to a record $2.7 trillion at the end of 2017, according to S&P Global Ratings. The junk-bond market in the U.S. has ballooned to more than $1.2 trillion and leveraged loans now total $1.3 trillion. Sen. Elizabeth Warren said Thursday that a buildup in leveraged loans is threatening the economy in the way subprime loans did leading up to the financial crisis. Baa 3-grade corporate debt outstanding reached an unprecedented 56.8% of high-yield corporate bonds outstanding. By comparison, the ratio of outstanding Baa 3-rated bonds to high-yield bonds was 32.5% before the 2008-2009 financial crisis, 36.9% before the 2001 recession and 22.2% before the 1990-1991 downturn. Another big stress test for credit markets is the falling price of oil which is just days away from a Burial Cross. Energy companies sold $50 billion in junk bonds through October, that was 14% of all junk bonds issued! Junk-rated energy companies trying to raise new money to service old debt or to fund costly fracking or off-shore drilling operations are suddenly hitting resistance. With falling oil prices, how are junk-bond holders going to get paid back? Up until now, many investors have ignored these risks because of surging corporate earnings, which were up almost 29 percent for the S&P 500 index in Q3 2018. However, earnings growth is expected to drop into single digits next year. Worse, the Federal Reserve is expected to increase rates next month which will further slow the economy. 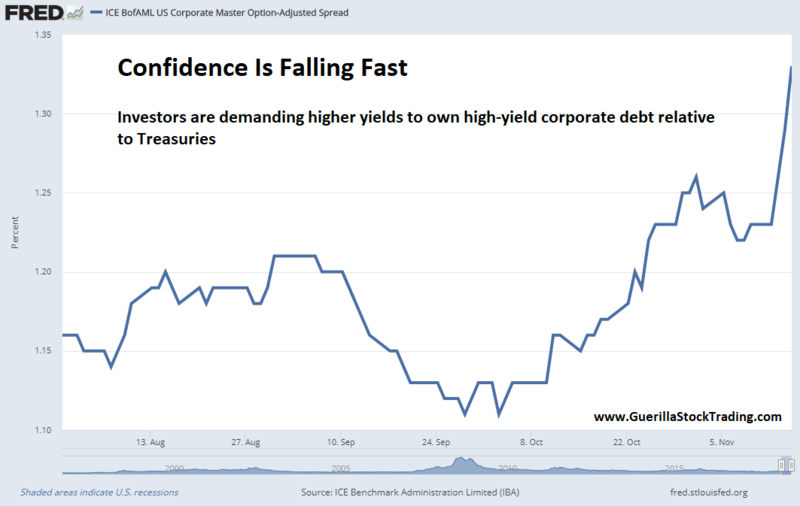 In other words, investors are viewing junk bonds as much more risky because the economy is slowing down thus they want more yield (reward) to take on that additional risk. If the Federal Reserve was guided by a policy of achieving the neutral rate (the point at which Fed policy neither contracts nor stimulates the economy), the Fed would have already stopped hiking rates back in May of 2018 when a Burial Cross formed on the chart of the Home Construction ETF (ITB) IMO. It became obvious to me in May of 2018 that the Fed was beyond the neutral rate and was actually contracting the US economy. Bloomberg published an excellent article on this subject entitled The Fed’s No Longer Guided by Concept of Neutral Rates. As the sell-off in junk bonds (tracking with the chart of HYG) deepened on Friday, November 16, 2018, the cost of insuring against defaults (credit default swaps) rose to the highest level since 2016.